The home of a bloke fingered by WiReD and tech blog Gizmodo as a possible inventor of Bitcoin has been raided by the Australian Federal Police – just hours after their articles were published. The Register was happy to watch the house publication of deluded entrepreneurs and Giz slug it out over whose evidence is best and who deserves the kudos for their "scoop." It seemed like Newsweek all over again. But during the afternoon, the yarn took a surprising turn: the Australian Federal Police (AFP) raided the home of Dr Craig Wright, who was named by WiReD as someone who may or may not be Bitcoin inventor Satoshi Nakamoto; Giz claimed Wright developed the cryptocurrency in cahoots with the late computer security guru Dave Kleiman. Nakamoto is a pseudonym – no one knows for sure who he or she is. It's a mystery that's been playing on minds since 2009. Cool your jets, though. According to the AFP, the police raid is over a tax matter unrelated to whether or not Wright is Satoshi Nakamoto. Wright's known business interests relate mostly to Bitcoin: as well as operating a BTC exchange, he has a company called Cloudcroft, which holds what's probably Australia's only privately owned Top-500 supercomputer – C01N operated by Tulip Trading. The umbrella company most associated with Wright, DeMorgan, lists security, banking and finance, maths, AI and software development as well as cryptocurrency. Earlier this year, DeMorgan had high hopes of turning its research into government R&D tax credits, as is outlined in this press release [PDF] – crucially, DeMorgan said its work could be worth up to AU$54m ($39m, £26m) under AusIndustry’s R&D tax incentive scheme. Worth AU$54m to DeMorgan, that is. At the homepage of another of his companies, Panopticrypt, Wright describes himself as “the only person in the world to hold all three GIAC Security Expert (GSE) certifications,” and therefore “certifiably the world’s foremost IT security expert”. With neither the WiReD story nor the Gizmodo story receiving comment from any of the players – Wright, the AFP nor the Australian Tax Office – it's impossible to assess whether publication in any way accelerated the federal cops' actions. The raid itself, however, was very public, because journalists were surrounding Wright's house in the hope of getting comment on the Bitcoin piece. It's worth noting that both WiReD and Gizmodo identify a huge block of Bitcoins as belonging to “The Tulip Trust”, a noticeable coincidence of name with the Cloudcroft supercomputer operator. WiReD's piece is here, and Gizmodo's here, for reference. Both articles rely on coincidences and evidence that can be falsified – for example, the PGP keys mentioned in the stories and supposedly linked to Nakamoto can be backdated, and are no smoking gun. The Register can't resist one cautionary tale to arise out of today: politicians need to take care in their endorsements. 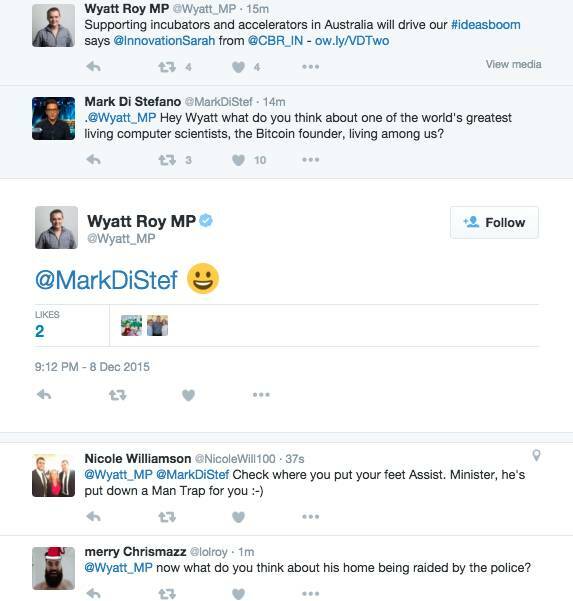 When all there was to the original story was Bitcoin's possible, maybe invention Down Under, Australian Assistant Minister for Innovation Wyatt Roy was rather pleased with the notion that the cryptocurrency may have been invented here.